The talking stick has been used for centuries by many Native American tribes. It represents the sacred power of words, freedom of speech, and the right of the speaker to be heard. It is usually passed from speaker to speaker as they take turns. 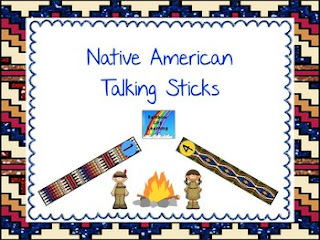 The sets of six talking sticks in this resource are meant to be used by each member of a book club, discussion group, or Socratic Circle to mark the number of turns they have taken in the discussion. Each student places one talking stick in front of himself/herself to signal that he/she has shared his/her thoughts with the group. If all sticks have been used, participants may choose to start over or to end the discussion. Your talking sticks should last all year if printed on card stock and laminated. Students can cut and store them in ziplock snack bags or attach with a paper clip. Included are full color version, less colorful version, black/white version, and plain white for your students to decorate themselves. Print one page for every four students. The Native American belief is that your words matter and should bring honor to you. May all of your students’ words bring honor to them and help them to grow!